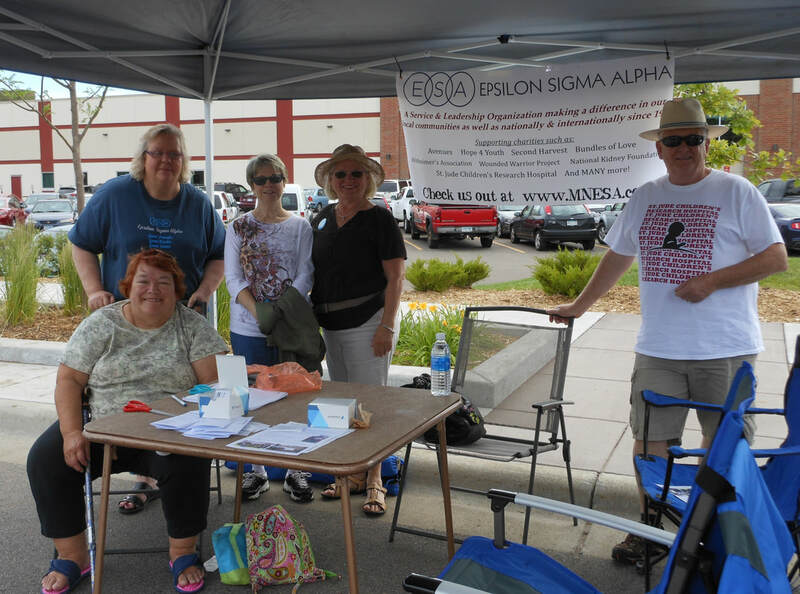 1st VP Sandy Dolence, President Sandy Hongerholt, Lynne Thiebault, Barb Haubrich, 2nd VP Dennis Marler and not pictured, Betty Marler, at the New Hope Farmers' Market promoting ESA. Good job, Sandy D. and ESA Team! ​Julene Donnay was the Chili Cook-Off Champion! Earl Brown Parade and the ESA Fire Truck 'float'. Thank you to Jon and Sandy Dolence for driving their 1937 fire truck in the parade for ESA! Gamma Omega Chapter gathered at Sandy D.'s cabin to create Santa Hugs for our IC Project. We folded, cut, re-designed and sewed over 20 Santa Hugs and had a grand time working on the project. Gamma Omega hosted a Hope for Heroes event to raise funds for the Minnesota Wounded Warriors Project on Oct. 4 at the Eagles Nest/Broadway Pizza in Robbinsdale, MN. They had a spaghetti buffet, bake sale, silent auction, pie auction, drawing for a quilt/hotel stay. What a fun event! Tom Cocchiarella from WWP-MN spoke at the event was was thrilled to receive over $2000 for our MN military.